ADad Win a $50 Gift Card To REI! 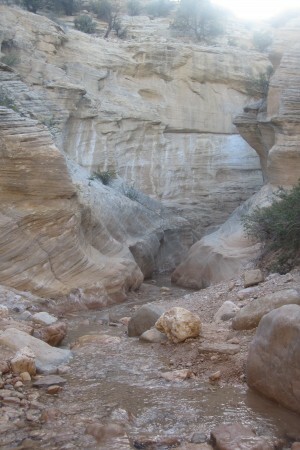 Six miles down a slot canyon with no possibility of going back up, we came to a creek bed junction. We knew we were making a loop back to our starting point 11 miles further on but had different concepts of which direction we should go. My intuition and brief memory of looking at the map in our hiking book said we should go clockwise and thus turn right. Alex’s memory on the other hand said to go counter-clockwise and thus take the canyon to the left. With no trail markers or foot prints to guide us, this would be the time to take out the map and find the correct trail. One problem, however, the book and map were back in the car! Needless to say, it was some tense moments as we tried to figure out the correct course. I’ve always counted on Alex’s sense of direction but was pretty sure we needed to head down stream at this point. Alex, on the other hand, grew frustrated by my questioning his judgment. (This is a classic dynamic for fathers with young adult children. After years of your being in charge of everything, you want them to take more control. They on the other hand want to feel in control and also be respected by you. It’s an evolving relationship dance that can easily lead to toes being stepped on.) To make matters worse, we both knew that we wouldn’t know who was right for at least another 11 miles up the trail. Running low on water in the desert heat and sun made it all that much more stressful. If we did pick the wrong trail, we would have to retrace our steps the next day and then do another 11 miles to get out. And all without much water! Needless to say, it was an anxious night’s sleep camping along the dry stream bed 5 miles up from where we hit the junction and wandering if we had made the right choice. We were all pretty exhausted from the day’s pack in and nervous about our dwindling supply of water. Starting out the next morning, it wasn’t until about 3 miles further up the trail that we saw our first signs of other beings in the area. While they appeared to be days old, seeing horse tracks and manure was encouraging. When hooking into another creek bed, we then found running water, deeper slot canyons and some spectacular water falls. Alex was right, we were on the right track. While we were able to laugh about it later, next time, we will all need to be sure that we have a map! If you are thinking about slot canyons and hiking in Southern Utah, check out Favorite Hikes In & Around Zion National Park by Tanya Milligan and Bo Beck. It’s loaded with great photos and easy to understand directions and maps. 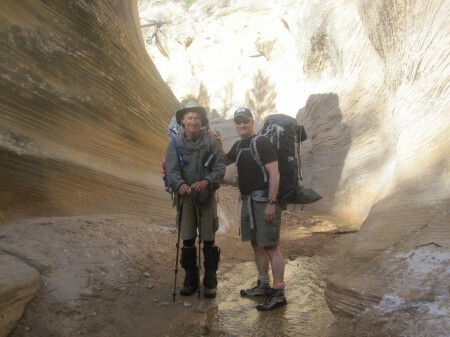 They also cover hikes for every age and ability level. Perfect for planning your next adventure no matter what age kids you have. We picked up our copy at REI. Deep in Southern Utah’s remote desert landscape sits the Grand Staircase-Escalante National Monument. Protecting 1.8 million acres, it’s an ideal location for hiking, horseback riding, and mountain biking. 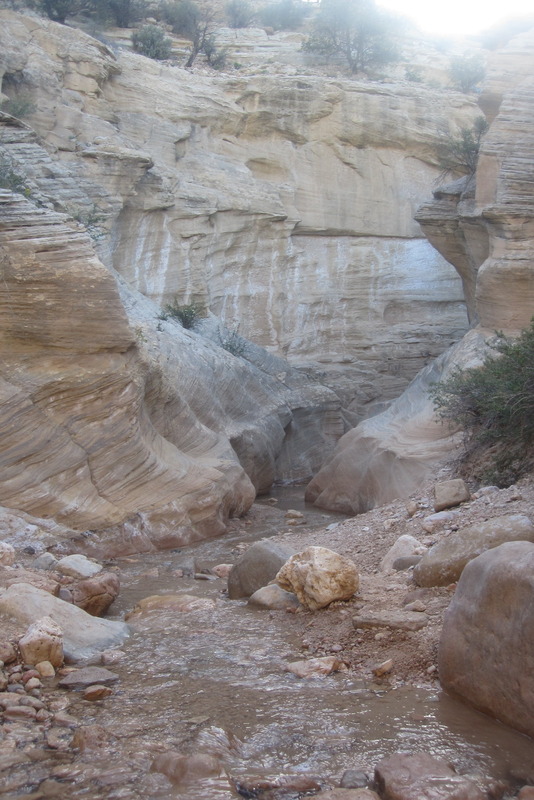 A place where one can easily find solitude as well as easily get lost in the deep slot canyon creek beds. For our first adventure into this massive wilderness, we selected the Bull Valley Gorge loop based on the Las Vegas REI team member’s suggestion and the two days we had for accomplishing the weekend trip. Seeing a photo of the deep canyon on the cover of a Utah climbing book further increased our excitement for exploring our first slot canyon. You sit up on a rugged, scraggly plateau as you drive south into the Grand Staircase. What you don’t realize, however, are the deep creek beds that weave throughout the landscape. When starting out with Alex and my brother John, we only had to hike a 1/8 mile down a trail to gain access to the stream bed. It wasn’t too long after that when the gorge got deeper and narrower. The site of the water worn sand walls going straight up for 50-75 feet inspires awe as well as a bit of fear. 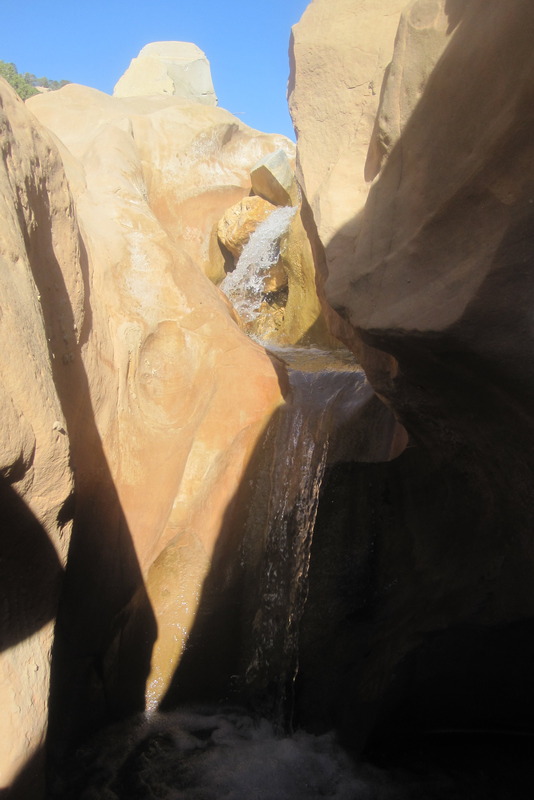 Some of the passageways were only 3-4 feet wide and the thought of a flash flood is always present. (Check the weather forecast ahead of time!) While not too terribly technical, you do need some rope and the ability to use them for lowering gear and bodies down some of the 15-20 foot drops. Fortunately, for us, Alex has developed a passion for the latest robe techniques! As you’ll see in the video, we had a lot of laughs and a few falls weaving our way through the long, dark passageways. At 17 miles, the two day loop was a fairly strenuous trek. The second half day was particularly tiring as the creek bed opened up and exposed us to the afternoon desert heat and sun. To say, “bring plenty of water” would be an understatement as we found our jugs bone dry by the time we returned to the vehicle. 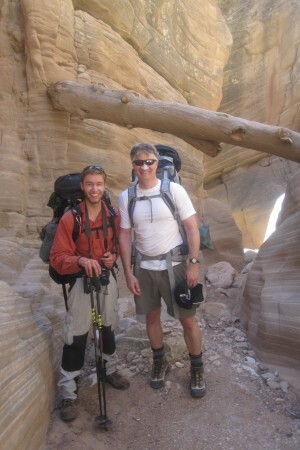 Oh yes, you’ll need to bring a map with you as navigating in desert landscape and deep canyons can be very tricky. N, S, E or W has a whole new meaning when you are 100 feet down. For a unique and memorable adventure, you won’t be disappointed! The Durango & Silverton Narrow Gauge Railroad passes through the heart of the San Juan mountains in southern Colorado, and they make a special stop in the middle of their trip. As you’ll see in the video, the train ride has some exciting moments twisting through deep gorges and alongside sheer drop offs. Half way to the town of Silverton (where the train stops and then heads back to Durango), the conductor stops the train, in what feels like the middle of nowhere, to drop off those who want to backpack into Chicago Basin (a large drainage area surrounded by 4 14’ers). It’s a pretty eerie feeling watching the train pull away knowing that it would be a 40 mile hike back to civilization in either direction with no cell service in case of an emergency. Alex and I hiked the very strenuous 6 miles into the basin. The trail followed along Chicago creek and gained some 4,000 feet in elevation. Packing light, I was more than ready to eat some dehydrated food and crawl into my bivy sack not long after selecting some trees to camp by. We spent the next two days hiking the 14’er’s. I’d start around 4:30 am with a headlamp while Alex slept in. He would catch me by 10 or so and then we’d come back down by noon so as to avoid the afternoon thunderstorms. After a particularly strenuous morning of climbing Alex decided to enjoy the cold and thrill of jumping into a high alpine lake and we both got a great laugh out of the mountain goats who followed us along the would lick the rocks any time we stopped to pee. Apparently, they like the salt left behind by the hikers. The final thrill of the trip was heading back down to catch the early afternoon train into Silverton. A late chili lunch at one of the town’s diners was perfect for warming us up before taking the train back to Durango. While the smoke and ash can get thick at times, it’s a great ride. If you get there, don’t forget to see the museum and roundhouse back in Silverton. To get more information on the Scenic Durango & Silverton Narrow Gauge Railroad visit their website at durangotrain.com. Finally, after six hours climbing a staircase carved into the side of Mt. Rainier, I made it to Camp Muir, the main launching station for those trying to summit the peak. As I came over the final crest at 10,080’, I could see the stone ranger station and sleeping hut. As I came up the steps, I felt exhilarated (despite my total exhaustion) as I looked out upon the rows of colorful tents and flags spread across the giant glacier field in front of me. It was everything I imagined it would be. When I finally found Alex, who had been waiting and resting in the sun, I discovered one more visual treat: the site of Alex’s CU Buff flag flying in the wind above our sleeping hut. While resting, your first impression of Camp Muir is shaped by the clouds below you and the long vistas out to the ocean and at the south base of Mt. Rainer. Unlike Colorado, where mountains are stacked up together in huge groups, Mr. Rainer and the surrounding peaks like Mt. Hood and Mt. Baker are volcanic peaks which literally shoot right out of the low plains surrounding them. After a short rest, we walked around and took in the other experiences which Camp Muir offers. You can meet climbers who come into camp in the mid afternoon following their 2:00 am trek to the top and are taking a quick rest before heading down. In the large glacial bowl, you can watch the groups practicing their ice climbing skills and getting ready for their early morning attempt. Or, as in our case, you can meet people who came up to have an amazing day hike and are heading down that afternoon. An addition that made our trip more convenient and fun was staying in the public hut which has bunks for about 20 mountaineers following the rule: First in time, first in right. The shelter also has an indoor ventilated cooking area for your camp stove. In addition to warmth from the cold night air and the sounds of falling rock throughout the night, we got to enjoy the warmth of other climbers who had plenty of stories to share (as well as food to trade) about their experience on the mountain. Our favorite was the father and thirteen year old son pair who were gearing up to leave at two and then camp out on an eastern snow field about three quarters the way to the summit. They were then planning on doing the summit the next evening. Talk about an AdventrueDad! The final treat of our stay at Camp Muir was seeing a helicopter fly in to drop of supplies and hall out trash and propane canisters from the ranger station. As you learn at the base ranger station, everything that comes up the mountain must come down. That meant that we had to take our CU flag along with us for our quick descent down the mountain. old daughter! Thanks Phil and many happy adventures. Just came across you site via you following me on Twitter. Fantastic site! little one in the future. that he’s taught his dad to “chill”. Well done PJ! PS. Peter, We know you were wondering how we could start so late out of Denver and still make it up to the hut before nightfall. You can’t believe how a snow mobile can speed up a hike!! For years, Alex and I have watched a variety of survival shows demonstrating how to make and sleep under your own shelter. This winter, we decided to try it out for ourselves and see if we could get a warm and comfy night’s sleep like the men in the shows. We tried out a couple of different styles, of which mine, got the most laughs. Fortunately, we had a test of snow late in the afternoon that demonstrated how inadequate my shelter was for snow protection. We both took extra time to bulk them up knowing that 4 – 6 inches was predicted for the night. Even with the extra cover, it’s amazing how snow can trickle down. Most importantly, you don’t dare touch the roof above your head and stimulate a cascade of snow down upon you. 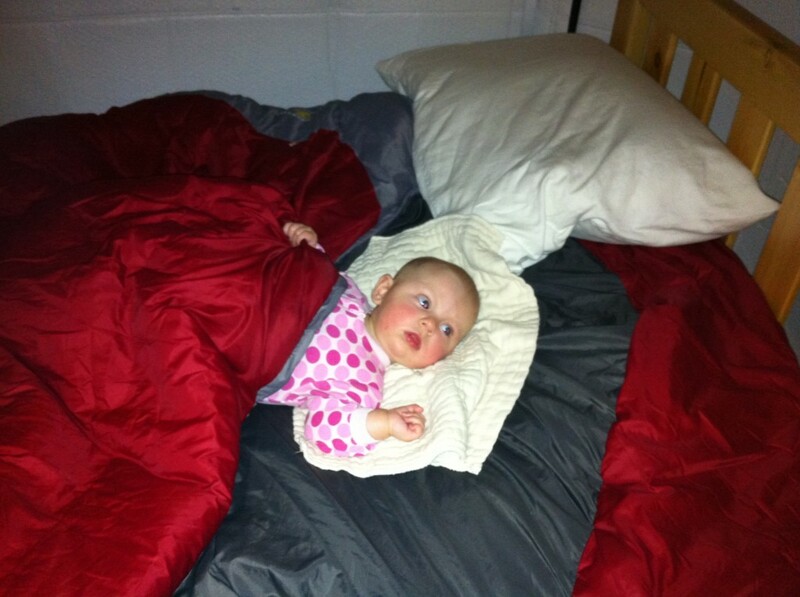 Even with tight quarters, we both had a good night’s sleep and a whole lot of laughs. Watching Alex encased in his sleeping bag, sliding out of his hut when trying to change some clothes is a great memory, as is, our dog Utah laying down in his shelter as if she was the happiest dog on the planet. When I first took Alex to the Grass Creek hut, in the Colorado State Forest, he was just 16 months old. He looked pretty snug in his car seat that fit perfectly into our backcountry sled. This past spring, we had a chance to go back to that same hut and remember many of the adventures we’ve had over the years. From his first snowshoeing, to starting fires, to chopping wood, our memories are chronicled in my journal, as well as, in the notebooks at the hut that are kept for visitors to write and draw. At 17, he’s now doing the muscle work and embracing the adventure as a young man. This year’s hut trip served as a base for our second adventure of the weekend, which was to sleep out in our own shelters. Snowshoeing helped us navigate the spring snow where one missed step could send you down 3 – 4 feet. The simple solution to spring conditions is to figure out where other travelers have gone before you and then follow their footsteps. You can also go early in the morning after thenighttime temperatures have frozen the snow’s surface. While we love the warmth and sun of spring, it can make for difficult snow travel. During the past holiday season, Alex and I took off on our annual winter camping trip. Unfortunately, our friends LC and Austin were unable to make it this year so we were on our own. In addition, this year, Alex wanted to camp at a higher elevation as well as sleep under a tarp rather than inside our 4 season tent. As you’ll see in the video, it was spartan and cold. Most difficult however, was the fourteen hours of darkness where the only activity is trying to stay warm. We hope you enjoy!